Visiting any of the baths is a great way to get fresh and well again after all the walking you do while sightseeing in our fabulous capital. You just can’t beat this type of relaxation. 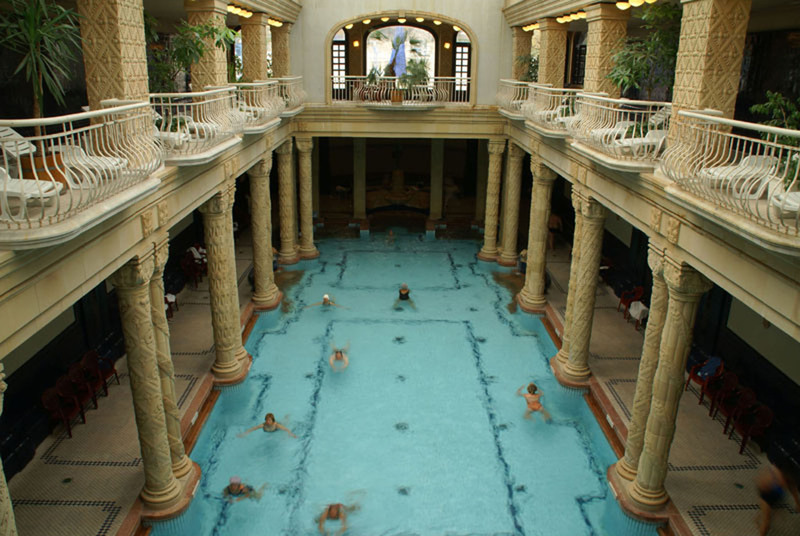 If you have never been to any of the baths in Budapest, there are three that I would highlight to learn more about the Hungarian bath culture. Rudas, Széchenyi and Gellért, all three have unique features and will surely be memorable. If you have already been to these three baths you should visit some others, like Veli Bej and Király. Different baths have different rules and procedures. I’ve collected some that are probably common to all baths. The prices and the services available are displayed in English at the entrance. In some baths the hosts and hostesses will give you a hand. In most baths you will receive a ‘wrist watch’ to wear which will grant you access into the baths as well as being a ‘key’ to your locker, which magnetically locks and unlocks. If you are a rather bashful type you can choose the individual changing cabins instead of the shared locker rooms. The changing cabins are more private and comfortable but cost a bit more. Before entering the pools showering is obligatory and, also, a step through a foot bath is required. Shooting photos in baths is not allowed. – Bathing suit/swimming trunks – Anything from speedos to board shorts for men and bikinis or one piece outfits for women. – Flip-flops or plastic sandals – Not required, but advised as you have to walk between the pools some of which may be outside. – Your own towels – You can also rent towels but depending on the bath the rented ones are rather like bed sheets (bathing sheets) and their absorbency is almost zero. – Swimming cap for lap pools (for lane swimming) – They can also be bought on site or rented with a deposit. It is usually only the lap pools where it is obligatory to wear, so for bathing it’s not necessary. – A bathrobe in colder weather may be a good idea as getting from one pool to the other in chilly weather is a quick dash without a robe especially when you visit the outside pools as well. Rudas is primarily about relaxation. This bath is most suited to adults without children as the services of Rudas Baths cannot be used by under 14s. 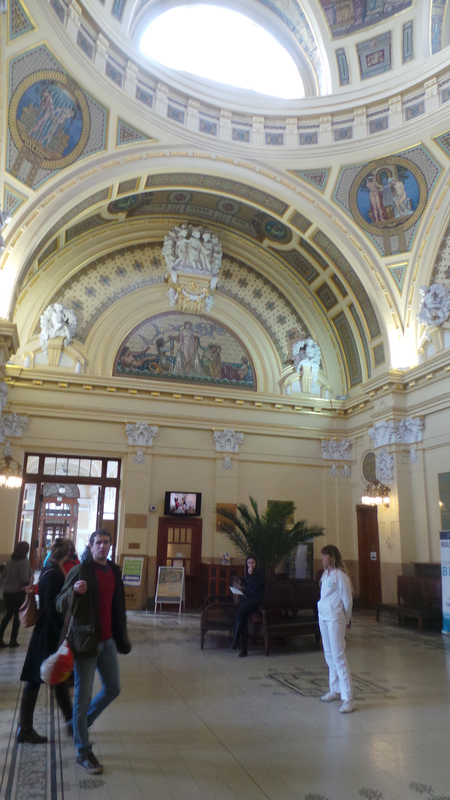 Those with children should choose either Széchenyi or Gellért or one of the beaches in the summer time, eg. Palatinus on Margit Sziget (Margaret Island). Here even just toilet trained children are allowed into the pools. For the night owls I suggest the night bathing every Friday and Saturday night from 10:00 PM until 4:00 AM but unfortunately the sauna world is not available during this time. 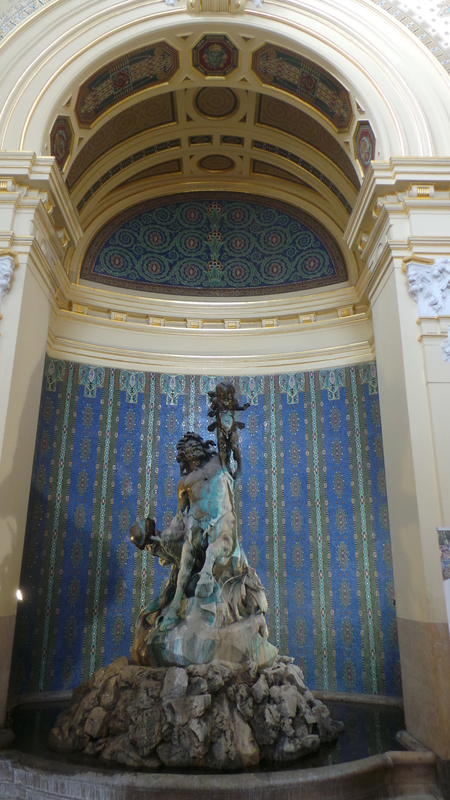 If you plan to visit with livelier friends, I suggest Széchenyi. The Saturday night SPARTY is probably for you. (Continue reading below for more information on SPARTIES). The oldest and youngest parts of the complex are the most interesting ones: The 500 year old Ottoman octagonal indoor pool and the brand new roof top pool. In the latter, you will surely be amazed by the view; you can enjoy a soak in the warm water whilst watching the sunset and the lights of Budapest. You will even see the spectacular Parliament building from the rooftop terrace. During colder months it may be a bit uncomfortable to get to the rooftop pool as you have to walk through the outside terrace. In fact, walking around Rudas can be a bit confusing as there are a few zigzagged pathways and stairs but it’s worth it when you find hidden rooms like a steam room or a salt chamber. You definitely don’t want to miss those. If you get a bit peckish during your visit, there is a very nice restaurant that serves gourmet food and lovely teas and coffees. If you go during the week between 11am and 5pm they often have a lunch time menu which you pay for as part of a ‘special ticket’ which includes both the lunch and your entrance. Ask us for the ticket during your check-in. Rudas is only just outside the city centre so it doesn’t take long to get there. From Ferenciek tere metro stop cross Erzsébet híd (Elisabeth Bridge) with bus number 7 or 107 (907 or 973 at night) and get off at Rudas Gyógyfürdő or you can walk across, it won’t take longer than 5 minutes, take a left at the end of the bridge and the bath is along the river front. 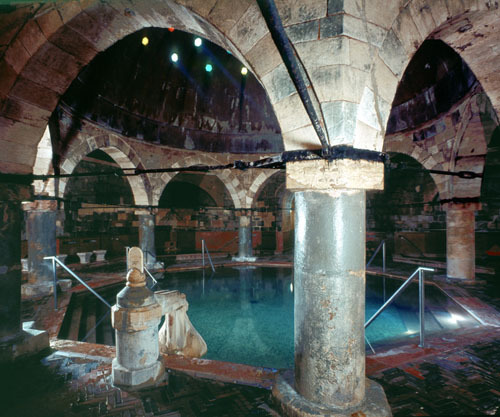 The 500 year old octagonal pool covered with a cupola (a domed roof) is just for males only or females only during the weekdays (Monday and Wednesday and Thursday for males, Tuesday for females). The other parts of the bath can be used by both sexes during the whole week. For mixed groups the best time to visit is on Fridays, Saturdays and Sundays so that all can enjoy the historical part of the bath. The water of the bath is not recommended for children under the age of 14, although children can still enter Széchenyi. In the case of very young children and babies, he/she can enter the pools only if toilet-trained. However, your children will surely enjoy the thermal outdoor activity pool with a jacuzzi and whirlpool. Have you ever thought about dancing in the pool? Does it sound weird? Well, on Saturday nights, Széchenyi is open for those who are looking for a special party experience in the hot water. These parties called SPARTIES are mainly suited to young adults but it’s definitely worth going there, whatever age you are, because of the amazing venue and the visuals. Check their timetable as the Sparties are not held every Saturday. Look for the elderly Hungarian men sitting in the water and playing chess. Quite an odd attraction of the baths but whenever I have been they are always there in the warmest outside pool on the right hand side. You may not think it but it’s a fabulous feeling to sit in the hot baths outdoors in cold winter weather with the mist floating over the water and when snow falls this adds to the experience. Also, I find the ornamentation of the lobby at the back side of the building wonderful; the whole building is filled with lots architecture of its time. Széchenyi bath (Széchenyi Fürdő) has its own stop on the yellow metro line (metro no. 1) and it’s not hard to miss as the building is bright yellow. This bath is suitable for everyone except babies. There is an outdoor children’s pool and a wave pool which are suitable for kids and the adults can enjoy the steam rooms and saunas. Note that the wave pool is only available through the summer months. The Gellért Thermal Bath built in a Secession (Art Nouveau) style opened its gates in 1918 so you can enjoy the beautiful architecture and wonderful Art Nouveau ornaments. Don’t miss the outside wave pool in warmer weather and the steam baths all year round. Take metro line 4 till Gellért tér stop or from Pest side cross Szabadság híd (Liberty Bridge) on foot and the bath is located within the building of the four star Gellért Hotel with the entrance on the Gellért Hill side. Gellért hotel is a rather grand building so it’s easy to spot. 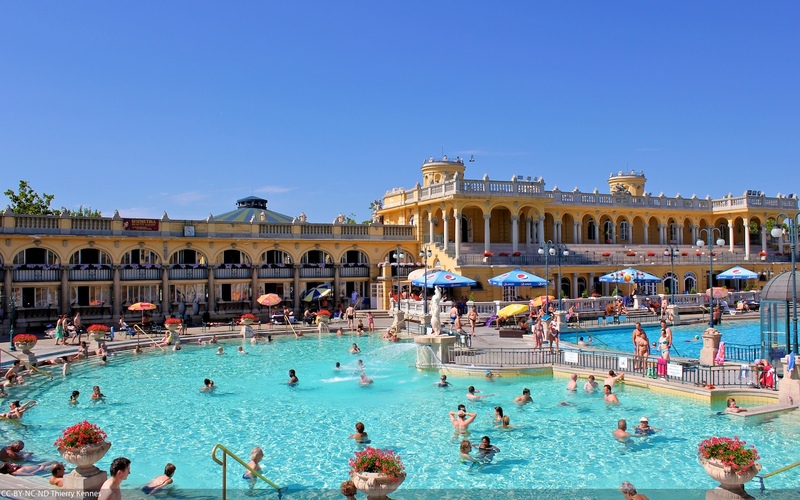 Like with Széchenyi baths, Gellért baths also has many other attractions nearby like the Cave Church (2 minute walk), Gellért Hill and the Citadel (15-20 minute walk up to get to the top) or Great Market Hall (10 minute walk) on the other side of river Danube.